Window Treatments. Free In-Home Design Advice. Professional Interior Designer. Local, owner-managed company. We really care! Best Shades, Drapes & Blinds in Las Vegas! Our designers offer FREE In-Home Design Advice in Las Vegas, Henderson, Summerlin and all local areas. Not only is this service free, and without obligation, but it is expert and professional! You meet a qualified designer, not a salesperson! Installing Window Treatments is a highly skilled job. Our Installers have years of experience and will ensure that everything fits and works perfectly. You have unlimited design choice. With thousands of fabrics, colors and style options, we can make whatever window treatments you want. Your designer will talk you through all the options, and answer your questions. 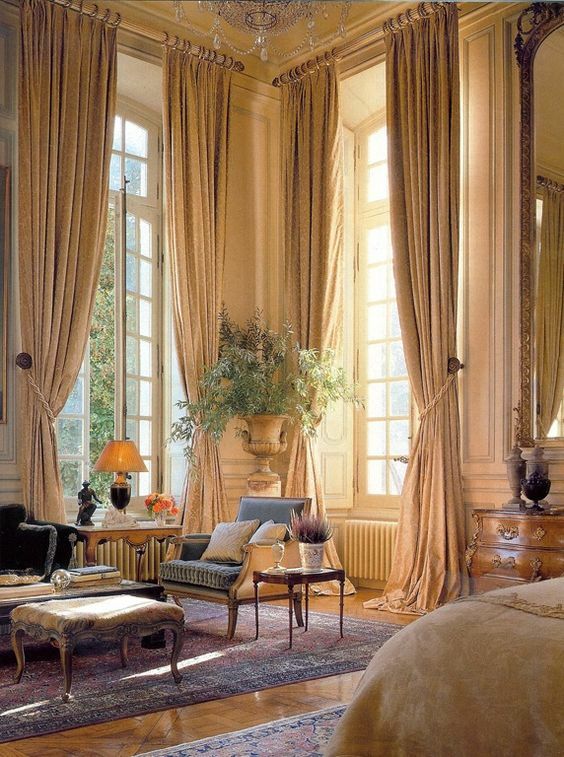 This photograph features classic, sumptuous draperies. This is a magnificent example of class and elegance, combined with practicality. But many drapes we make are simple, elegant, and suited to smaller modern homes. Please see our Photo Gallery to get some idea of the vast range of draperies we custom design for our clients. Whether you need Window Treatments for just one window, an entire home, or your offices or business premises, we can design, make and install something really special for you. We are designers. So we offer more than just Shades, Drapes and Blinds. Our custom designs include: Faux Iron Grilles, Upholstery, Pillows & Cushions. We accurately measure windows using precise electronic measuring devices. Our design advice is expert. Whether you want complex draperies or simple blinds, you will get something that fits perfectly, looks and works great, and that you will love and be proud of. Other companies employ salespeople who simply do not have the skill or experience that we offer. Time and time again our customers tell us how amazed and delighted they were at how much effort we put into finding the perfect solution for them. Our custom drapes are the best quality and price you can buy in the Las Vegas area. We design and make them, so we keep the costs down. Most other companies selling drapes buy them in from an out of State supplier. This means delivery delays, higher prices and lack of quality control. If you want beautiful custom drapes, our prices are fair and attractive. We offer the best design and quality, at prices lower than companies offering vastly inferior products and service. Shades and Blinds are sourced from top American based manufacturers. We sell everything at a discount, so you buy at considerably less than recommended retail prices. Unlike box stores and cheap suppliers, we provide a full design and installation service. And all our products come with warranties. If you want excellent quality and service, at an attractive price, then please talk to us! It is always possible to buy things more cheaply. But cheap window coverings don’t look good, don’t last, and end up being a waste of money. We don’t sell cheap window coverings. We do sell excellent window coverings that represent great value for money! Motorization is the easy way to open and close shades,drapes and blinds at the touch of a button. No dangling cords means that you have child safety. Easy to use, so that you get privacy and protection from heat in summer, and cold in winter. To buy a new home, or to remodel an existing home, is expensive. If you need help with finance we can help. Our design consultant who will be happy to be of assistance. Even if you have all the cash you need, you may like to consider the benefits of having a loan for 18 months at zero APR.